Electronics designer, manufacturer and supplier, Kramer Electronics, and Calibre UK, British electronics manufacturer, have entered a global joint sales, supply, development and business co-operation agreement. 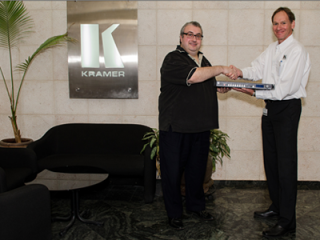 Tim Brooksbank, Chairman of Calibre UK and Aviv Ron, Kramer's VP Business Development & Strategy at Kramer's head office in Jerusalem, with one of their first joint products to debut at ISE 2014. Calibre’s key models for the Pro-AV & Broadcast industries are to be incorporated into Kramer’s product line-up in Q4 this year. This strengthens Kramer’s range by the addition of a new line of premium scalers including low-latency processing, warping, geometry correction, and edge blending with models for fixed installation and rental and staging, as well as models targeted at LED video walls and television broadcast studios. The two companies have also agreed to work together to accelerate Calibre’s future product developments and have plans to roll out a range of premium video processing, routing and control products. To support customers and the implementation of new product introductions, Kramer Electronics will supply dedicated resources to support and market these new models throughout Kramer Electronics’ worldwide network of more than 20 regional offices.